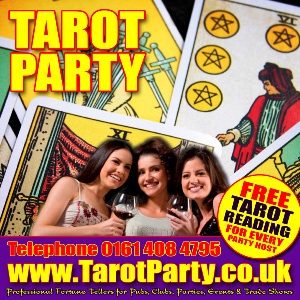 Tarot Party are one of the leading suppilers of Fortune Tellers for House Parties in the UK. Organise a Tarot Party at your house & recieve a FREE Tarot Reading in return! As a thank you for organising the party, and inviting your guests, you as the host will recieve your Tarot Reading at no charge. Tarot Parties are a fantastic way to have fun with your family and friends. All you have to do is invite the guests, supply the wine, nibbles and music and a table (preferably in a separate room) and we’ll do the rest! Our readers are carefully chosen to ensure that your Tarot House Party is a fantastic success. Call us on 0161 408 4795 today to find out more!